The town of Shandaken, NY, about 15 miles west of Woodstock in Catskill Park, has long served as a wilderness retreat for artists, musicians, chefs and urban professionals seeking escape or spiritual connection in the mountains. Indeed, beginning in the 1950s, French chefs in New York City, including Jacques Pepin and Pierre Franey, vacationed in town and later opened restaurants here; Big Indian was the site of an ashram in the 1970s; Janis Joplin and Jimi Hendrix frequented a sweat lodge in Woodland Valley; and today the Zen Mountain Monastery houses a temple and training center open to the public in Mount Tremper, while the Menla Mountain Retreat and Conference Center is run by New York City’s Tibet House in Phoenicia. 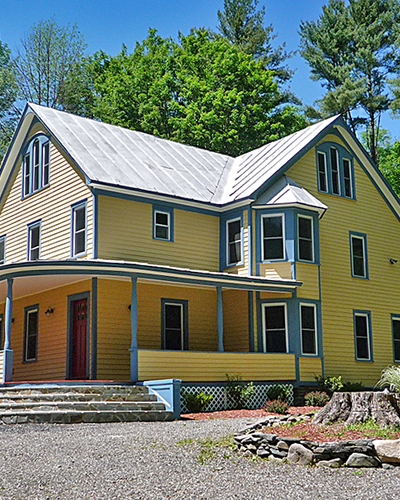 Shandaken is comprised of 12 small rural hamlets, including Phoenicia, with its picturesque one-block Main Street full of restaurants, antique shops and art galleries. The town is covered by 54,000 acres of forest, 70% of which is owned and protected by New York State; it’s also home to Slide Mountain, the highest point in the Catskill Mountains, made famous by the writings of local nature essayist and conservationist John Burroughs. Other popular destinations in Shandaken include State-owned Belleayre Mountain, a four-season ski resort in the hamlet of Highmount; and Belleayre Beach in Pine Hill, which offers swimming, boating, kayaking, fishing and even a climbing wall.